Planting the sustainability seed early is key for lifelong awareness, and Arizona State University’s efforts to do that with community education were recognized Wednesday with a 2017 Best of Green Schools award from the Center for Green Schools at the U.S Green Building Council, in collaboration with the Green Schools National Network. The award highlighted ASU’s variety of programs for middle and high school students, such as the Poly Garden, which leases three of its 48 campus-community garden plots to ASU Preparatory Academy’s sixth- and seventh-grade classrooms and high school environmental science students each semester. To date, the students have logged approximately 2,400 hours in the garden and donated more than 135 pounds of produce to a local food bank. Also spotlighted were the university’s two sustainability education programs targeted toward K-12 teachers, the Sustainability Science Education program and Sustainability Teachers' Academy. The award honorees were announced at the Green Schools Conference and Expo in Atlanta. Community garden at ASU Polytechnic campus teaches sustainability. Organizer says ASU Poly community garden is ready to expand. 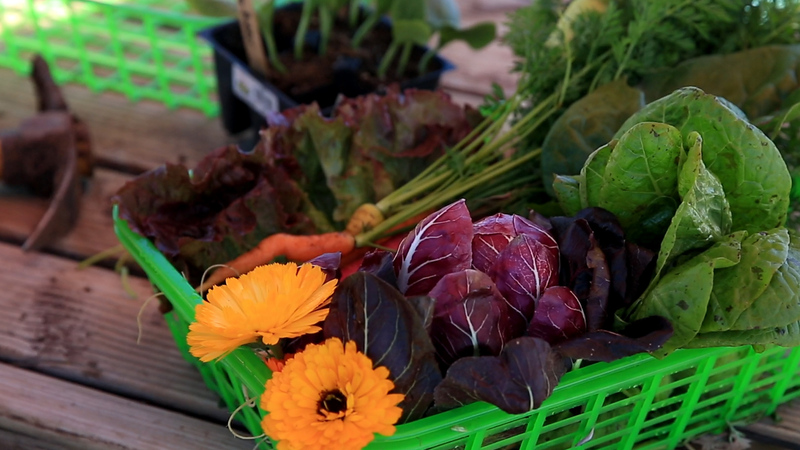 It’s harvest season at Arizona State University’s Polytechnic campus community garden. Green-thumbed Sun Devils are bringing in winter crops such as peas, kale and carrots on a plot of land situated in the North Village between two rows of homes built when Polytechnic was Williams Air Force Base. Available to faculty, staff and students, the garden has been used for capstone projects and outdoor class lessons. Susan Norton, program manager in University Sustainability PracticesPart of University Business Services., said the garden helps students understand food systems, waste management, electricity and water conservation in the desert. Also, “it opens the minds of students to what it means to eat local, what it tastes like, and why it is important,” she said. The garden itself is a model of sustainability. Those who lease space through Norton’s program maintain it. Norton said there’s a waiting list and that she wants to expand to a more accessible space. “Our future goal is to move this garden to the center of campus,” she said. Much of what the garden grows is donated to food banks, about 370 pounds so far, Norton said. Summer crops will include tomatoes, squash and cucumber. Norton hopes students who leave the Polytechnic community growing patch after graduation will take the principles they learn about urban gardening and sustainable practices and implement those skills once they become homeowners or renters, continuing to use sustainable land-design techniques to improve their communities. “We are trying to teach students that urban gardens are good for greening a community and give students ideas on how to be sustainable with gardening practices,” Norton said. Watch a video tour of the proposed expansion below.